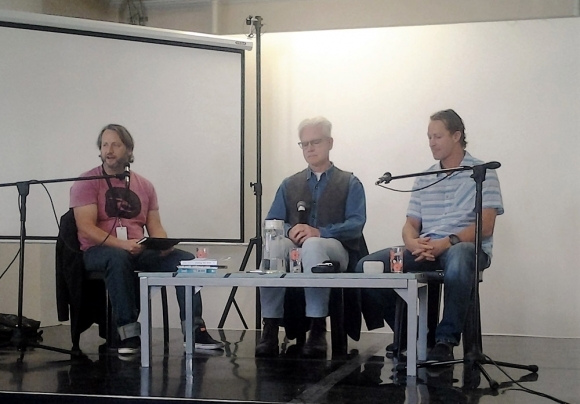 Deep energy swell rolled into Cape Town when Cambridge lecturer and writer Andy Martin arrived at the Open Book Festival to chat with Chris Bertish and Glen Thompson, writes Melissa Volker. It was as much a weird blend of academia and aloha on stage as it was in the audience. There was a mix of readers who surf (or surfers who read?) and literati, those bookworms and mind surfers who never have (and never will) get on a surfboard. In his book Stoked, Chris Bertish is a man of planning and preparation. Surfing is like life. As every wave is different, so is every situation in life. Big waves require preparation. Prepare for the worst, he says, but hope for the best. Andy Martin, on the other hand, albeit a fair weather surfer, shreds the philosophical wave. Jean-Paul Sartre, he reflects, would see surfing as the purest form of pleasure, even more so than the near perfect sport of skiing. For there on the slopes, the skier leaves tracks in the snow. The surfer, however, carves the waves, but leaves nothing behind. Writing about surfing seems to trivialize it, says Andy. But he concedes that one is driven to record it, to mythologize it. We are obsessed with the ocean, the environment in which we cannot ultimately survive. We dive into this environment through Martin’s writing in Stealing The Wave. When Mark Foo dropped in on Ken Bradshaw at Waimea Bay, Bradshaw paddled over, grabbed Foo’s board, whacked out the fins and then bit a big chunk out the rail. Andy Martin says in the book that when he asked Bradshaw about the board biting, he answered technically, as if the question was more how than why. 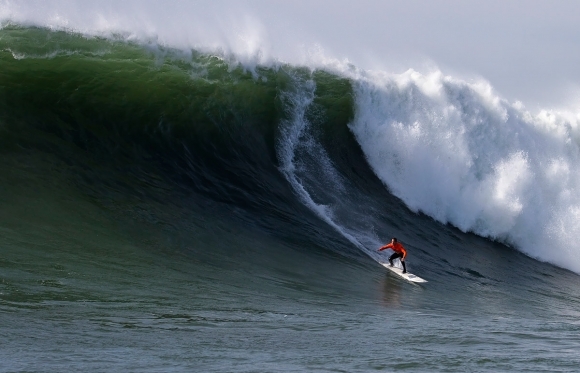 Bertish says that big wave surfers are more chilled and mellow now. He refers to the brotherhood of big wave surfers, and this is where I feel the waters become murkier than Muizenberg in a miserable southeaster. In fact, when a linguist in the audience asks how this brotherhood impacts female surfers, a trickle of sweat on behalf of Chris Bertish emerges on my brow. According to Bertish, however, brotherhood does not refer to gender, but rather to the connection with people in the ocean. "Girls" are charging, he says. I gulp. Was he about to be sucked over the falls? “Girls? Not women?” asks the audience faster than I can tweet the question, and another bead of sweat prickles my hairline for the waterman. But he handles the issue like he handles the ledge on a sixty foot face. He tells the story of Maya Gabeira’s near drowning at Navare and defends her right to be there and extols her preparation and commitment to big wave surfing. While there are few women surfing big waves in Cape Town, Bertish says they are surfing them elsewhere and have every right to be there. Although, as Andy Martin says, the brotherhood in surfing strikes a patriarchal note, Chris Bertish maintains that the notion of brotherhood is about connecting with people in the ocean. And in big waves that connection is shown by surfers who will put themselves in harm’s way to help others they hardly know, male or female..
Bertish lives the inclusivity of this brotherhood afterward at the book signing, discussing a strategy to overcome fear of backline with a little girl. 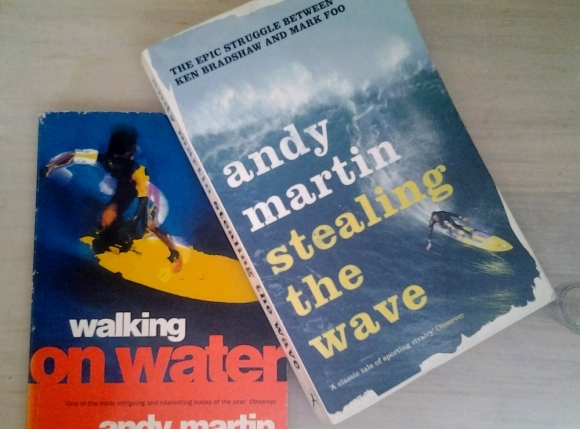 In my anecdotal experience, the biggest barrier between women and surfing is fear, and that is why books like Stoked, Walking On Water and Stealing the Wave are so important. Knowledge is power and forms part of the necessary preparation for waves, whether they be three foot spillers or heaving sixty foot monsters. Glen concludes the session by asking the writer/surfers to share their best and worst surfing moments, and the room cannot help but feel the stoke. Bertish shares the high of pulling on a contest vest at The Eddie alongside Kelly Slater, after sacrificing his job to be there, only to have the event called off at the waterline. Andy Martin shares a moment on the beach at Pipeline (A moment he describes in Stealing the Wave he as “one of the proudest, most electrifying moments of my entire life.”) He is asked by two lovely girls if he is Kelly Slater. The next moment, however, is his worst. He admits that he is not. It was awesome that surfing and literature blended at the Open Book Fest this year. 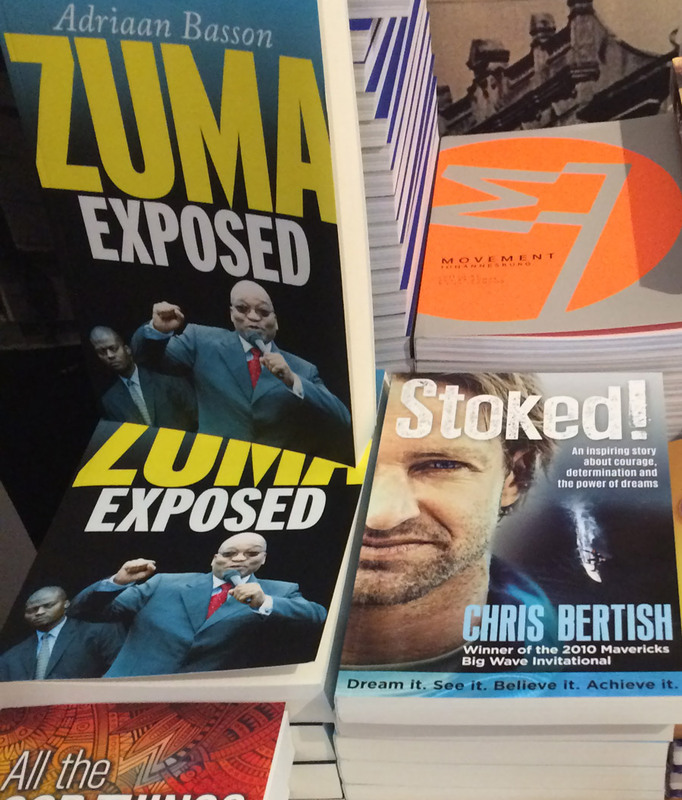 With so many great surfing books being written, let's hope the ensuing groundswell makes more literary waves.